Hi, legacy video fans! A very extensive video biography edit has kept me hopping the past couple of months and so I’m taking a quick breather during my July 4 holiday to draft this abbreviated newsletter for you. I have a recommendation of a recent documentary, and announcement of a change in product offerings, as well as a Legacy Video Lounge podcast update. A documentary/memoir worth a look-see. Independence Day here in the U.S. just wouldn’t be the same without a fireworks display painting the night sky in bursts of colors and sounds. But if you’re a child of the sixties, like me, you witnessed some truly unforgettable pyrotechnic displays each time NASA launched another manned mission into space, culminating with the huge Saturn V boosters that rocketed crews to the moon. I’ve always felt this was one of the most exciting episodes in the history of the United States, and over the years I’ve eagerly read books and watched documentaries and movies delving into the stories behind the manned space program. The Last Man on the Moon is the latest of these. It’s an interesting melding of documentary and memoir, focusing on Apollo 17 commander Gene Cernan. 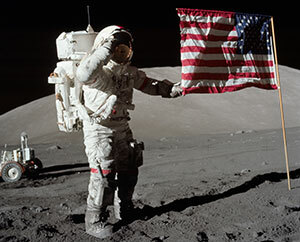 The film blends great archival footage, realistic reenactments, and Cernan’s reminiscences in order to chart the course of the space program and the role Cernan played in it. I throughly enjoyed “Last Man” and will probably add it to my collection. I highly recommend it. Family Legacy Video to discontinue DIY products. Family Legacy Video will soon end sales of our line of “do-it-yourself” products, including the Family Legacy Video® Producer’s Guide on CD, the Family Legacy Video® Producer’ e-Guide, and the Family Legacy Video® Producer’s Music CD. The products have benefited many customers over the years, but the company has decided to concentrate solely on custom video biography production. There are currently just nine Producer’s Guide CDs left in stock. Sales will cease when the last guide is sold or the summer ends – whichever comes first. The June podcast episode focused on the importance of the preinterview as a first step in the video biography process. You’ll find that episode and all of the other Legacy Video Lounge podcasts here.